Timothy is one of the men that Paul travels and teaches with. 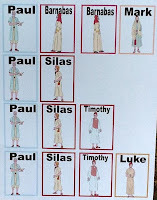 The printable for this lesson is a review of the other men that Paul traveled with. Review: Last week Paul and Barnabas were in Lystra. Paul healed a man that had been crippled since birth. The people thought that Paul and Barnabas were gods that looked like people. They explained that they were not gods, small g, and that they wanted to tell them about God that created everything. God in heaven, capitol G.
The Jews that were after Paul, talked the people into stoning Paul. They took him to the outside of the city and stoned him. They thought he was dead, but the Christians took Paul back into the city, and Paul and Barnabas left the next morning. Click here to print posters. Lesson: Scripture is Acts 15:1 -16:10. Paul and Barnabas stayed at Antioch for a long time with the disciples, and then they heard about some problems in the church and traveled to Jerusalem. The Christians, apostles and the elders in Jerusalem were happy to see them. They wanted to settle some questions in Jerusalem that the people had. Then, some days later, Paul told Barnabas that they should go back to visit the cities they had preached at and see how they were doing. Barnabas wanted to take his cousin Mark (Colossians 4:10), but Paul didn’t want to since he didn’t stay with them the last time. Barnabas wanted to give him another chance. Paul insisted that Mark shouldn’t travel with them. (Acts 15:39) They couldn’t agree so they separated. Barnabas took Mark and sailed to Cyprus. (Acts 15:37) And Paul chose Silas to travel with him. Even though they went different ways to preach the Gospel, Paul and Barnabas still respected each other. Paul and Silas went to some of the same churches that Paul had started earlier. And as they were traveling, they went to Lystra. It has been five years since Paul has been to Lystra. The last time, people had stoned him and left him thinking he was dead. 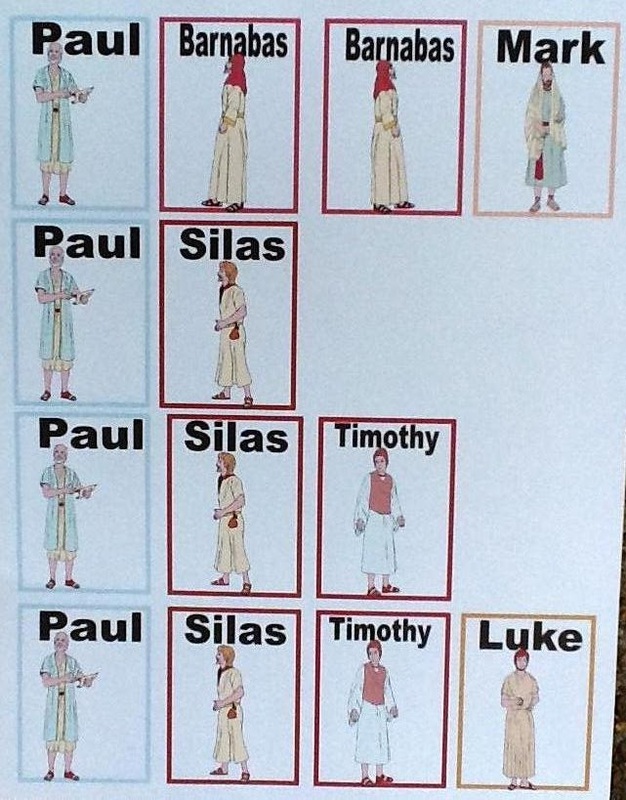 Paul and Silas met a young disciple there named Timothy. His mother was a Christian, but his father wasn’t. From the time Timothy was very young, his mother Eunice and his grandmother, Lois, taught him the Old Testament. (2 Timothy 1:5) Timothy's Mother and Grandmother told him about Jesus coming and they believed. Timothy knew the scriptures well. Paul taught Timothy about being a Christian when he was in Lystra before, so Timothy was a Christian for about four years. The churches grew daily with more people and with faith in God. (Acts 16:5) The churches were strengthened in the faith, and increased in number daily. While Paul, Silas and Timothy were at Troas, a man came to Paul in his dreams one night. He pleaded with Paul to go to Macedonia to help them. Immediately, they went to preach at Macedonia. Click here to download Luke poster. Read Acts 16:10 Around this time, Luke joined with them. He was a doctor. He wrote 2 books of the New Testament. He wrote Luke and Acts. Before he has been writing about what happened, and now he is saying ‘we’, so Luke is with Paul, Timothy and Silas. Remember that these lessons about the early Christians and the life of Paul are found in Acts. This flip chart was used during the lesson. As I pointed out each man Paul traveled with, the kids could flip the pages in their book and see each group. Again, there are several choices for this flip-chart. It is printable in color or black and white. I also made it so you can cut and glue the men to the pages. You can also use them as cards, instead of a flip chart.